I picked up my Surface RT on launch day last year as I happened to be in New York for work. The strong yen made it a bargain and I’ve been living with it since. Because it won’t run most desktop apps, it has seen limited use. It was an excellent video player during flights, but nothing an iPad could not have handled. Word made a passing replacement for Windows Live Writer with it’s built in blogging system, but it wasn’t perfect. Thanks to Microsoft locking down compilation for ARM-based apps, third parties have not been able to fill in the missing functionality gaps. Read on for my views on living with the Surface RT for six months, and why I’ve picked up a Pro. 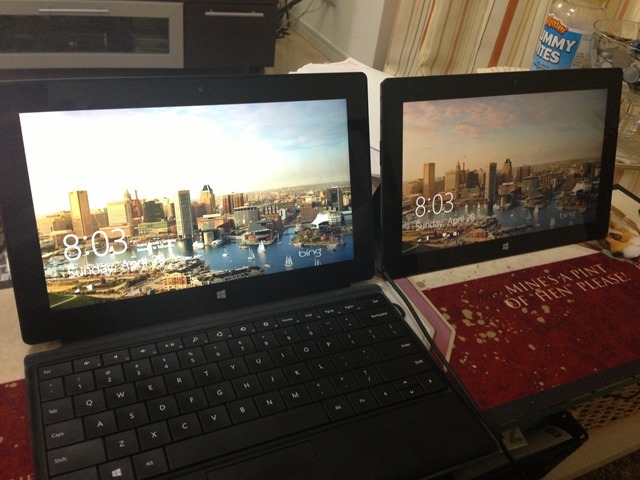 Surface Pro on the left, Surface RT on the right. Note the difference in kickstand angles. Where the Surface RT absolutely shined was a thin client, Remote Desktop machine. The latest version of the RDP Protocol that ships with Windows 8 is another leap forward from previous versions. Whilst we lose Aero remoting, we gain adaptive encoding that encodes different parts of the screen in the most appropriate fashion, changing algorithms for text, pictures and even video. Video now streams due to re-encoding on the host side – previous versions of RDP required Media Foundation compliant players which would attempt to bitstream the actual video file when being played. In reality, this only worked with Windows Media Player when playing MP4 or WMV video files. UDP support also improves connection reliability. Remote Desktop is the reason I am not keen on using Macs when I have even one Windows machine in active use. The version of the Remote Desktop client for OS X runs a protocol somewhere between Windows XP and Windows Vista – it supports network-level authentication but the performance is that of an old Windows XP client, with almost a decade-old set of algorithms for streaming the session. It is unusable over cellular links and glitchy even over LAN. Surface RT of course has none of these problems due to an up to date client. Because you cannot install binaries unless signed by Microsoft, you can kiss goodbye to the idea of doing any “real” work on the host OS of the Surface RT, beyond simple Office work in Word and Powerpoint. Outlook is not available, so you’ll be relegated to webmail (the Metro Mail app is so bad it is not worth talking about). You can of course Remote Desktop to a work machine, but be warned that if you require a non-standard VPN connection (such as Cisco AnyConnect), you won’t be able to install the software required to connect to your workplace. I travel a bit for business, and the Surface RT has been great as a video player – the built in kickstand perfectly fitting on an economy airline table. The battery life will last even the majority of a 13 hour flight. Just remember you won’t be able to do real work on it (unless Powerpoint is your job) – so if you are flying business because your firm hopes you might get some work done (and be well rested), you’ll need to bring a real laptop with you. The Surface RT is small enough to slip in the same laptop sleeve as the MacBook I use for work, so carrying it is not a burden. However, MacBooks can play videos quite well and business class has power adapters so the Surface is a bit unwelcome if you have a “work laptop”. So what made me get a Surface Pro? Ultimately it came down to it’s biggest failing – note-taking. Surface RT ships with it’s killer app, OneNote, but with a touch screen that won’t handle stylus input. I wanted to do some sketches in OneNote, so picked up the Adonit JotPlus capacitive stylus. Whilst it was somewhat accurate enough, the lack of palm detection made writing and drawing impossible. In OneNote – an application designed for handwriting and drawing. Palm Detection prevents your hand from interrupting your drawing, but with no stylus support, the Surface RT has no way of knowing what is a “pen” or your finger. This was a bridge too far. I used to use OneNote back at university with the awesome, ahead of it’s time, HP TC1100. 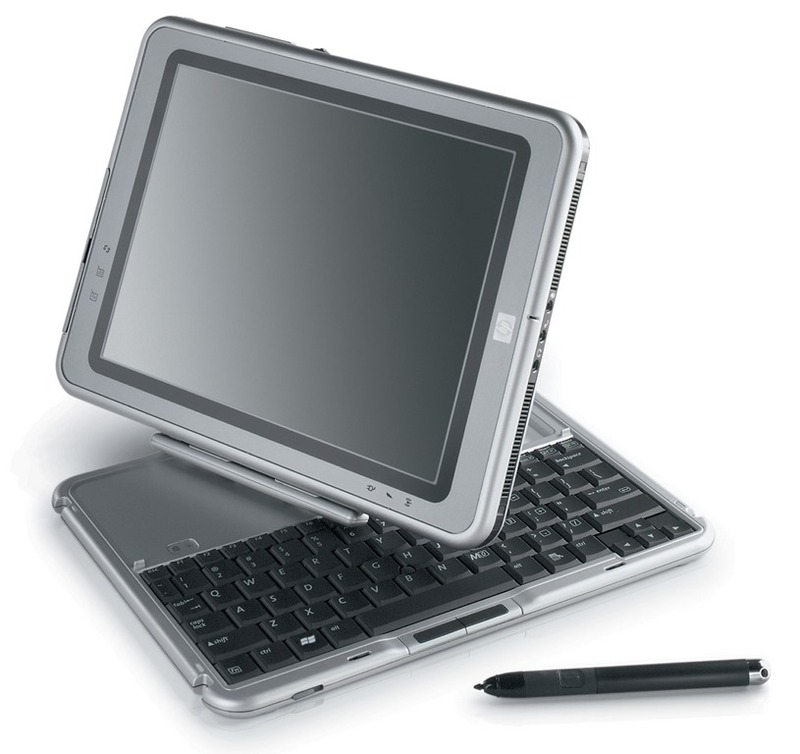 The HP TC1100 discontinued in 2005 – look familiar? The TC1100 had a Wacom stylus and digitizer (like the Surface Pro), a detachable keyboard (like the Surface Pro) and a 10.1 screen (like the Surface Pro, but 4:3 like the iPad, so actually useable in portrait orientation). Tablet PCs fell out of fashion around the time Windows Vista came on the scene – maybe because it wouldn’t run on any of them. I remembered how OneNote basically got me through four years of note taking at University with this pen, before the battery completely died. So, the Surface Pro can do everything the RT can do, except run for 9 hours on a single charge. However, it has a stylus, runs all Windows apps, supports unorthodox VPN software and even uses the same Touch Cover of the Surface RT? I was sold. After picking up the Adonis JotPlus pen from LOAX in Shibuya, trying it out in the pub and realizing that this isn’t the tablet experience I remember from 2004, I got on a train to Akihabara to see if I can find a Surface Pro. Surface Pro has no scheduled date for Japan. Next month, Microsoft will release the Surface Pro in the UK, Australia, Austria, Belgium, Denmark, Finland, France, Germany, Hong Kong, Ireland, Italy, Luxembourg, New Zealand, the Netherlands, Norway, Portugal, Spain, Sweden, and Switzerland. But not Japan. The first place I went was IOSYS in Akihabara, opposite Donki Houtei – the same place I got my Nokia Lumia 800 last year. This is a great shop that sells imported (US) phones and tablets. They had the Surface Pro in stock (along with the RT), the 64GB model was 124,999 yen, the 128GB was 139,999 yen. Note that this does not include a Touch or Type Cover (I already have a Type Cover for the RT) and works out at about $1400 – a 40% markup on the US RRP of $999. This isn’t a bad deal considering sales tax, shipping and the possibility of being stung by customs on import taxes. Its still a significant markup, but they do provide a 6 month warranty. I picked up the 128GB model. The Surface Pro is slightly thicker than the RT, but unless you compare the two side by side, you don’t notice after a while. The angle of the kickstand is a little lower (meaning that it points up a bit more). The screen is at 1920×1080 and Windows has the desktop scaled to 150% to compensate. Be ready for some blurry text in badly-written applications unless you drop it down to 100% scaling. The high resolution isn’t too unusable if you are sitting in front of the machine, but the same restrictions about using it in your lap apply. Not that you’d want to – both Surface models are notoriously hard to use with the keyboard attached on your lap on in bed. Performance is that of an average Core i5 laptop with an SSD installed. Visual Studio and SQL Server both installed in 15 minutes, whereas Office was pre-installed. All my machines are SSDs now, so performance is very similar across devices – the slightly slower processor here might bite me later if I decide to do something like encode video on the Surface Pro, but I would probably farm that out to my desktop machines. The RAM is a paltry 4GB but Windows 8 is very economical with OS memory usage. Serious processing tasks will still be farmed out to a larger machine. The pièce de résistance is the stylus. It attaches to the power charger magnets instead of sliding inside the device like older Tablet PCs. The magnets are strong though and I haven’t had it disconnect in my bag yet. I don’t think this will be as easy to lose as some reviews are claiming. The stylus in OneNote compared to the JotPlus “fake finger” stylus is like night and day – the pen supports multiple pressure levels and you can reverse it and erase with the opposite end of the pen – exactly like in 2004. The biggest downside is the widescreen ratio of the Surface and the fact that portrait mode looks so stupid – maybe we’ll get a 4:3 version someday. For media playing, it does everything the RT does, but you can actually install VLC and WinAmp. No longer do I have to convert MKVs to MP4 like I had to on the RT. Ultimately I feel I will still use the Surface RT as a “holiday” device and the Surface Pro as a “business trip” device. The RT does everything I need for recreational purposes, with the ability to Remote Desktop into a “real” machine if I need access to unavailable applications. The Pro however, whilst I have no intention of doing so myself, could easily be a desktop replacement. The stylus has already reawakened my almost decade old OneNote obsession. I’ll probably write up my experiences with the Surface Pro in a couple of months time. Stay tuned. I have the PRO but I am STRONGLY considering picking up the RT just for, as you say, a “holiday device.” The battery on my Pro just seems to go dry when I need it the most.